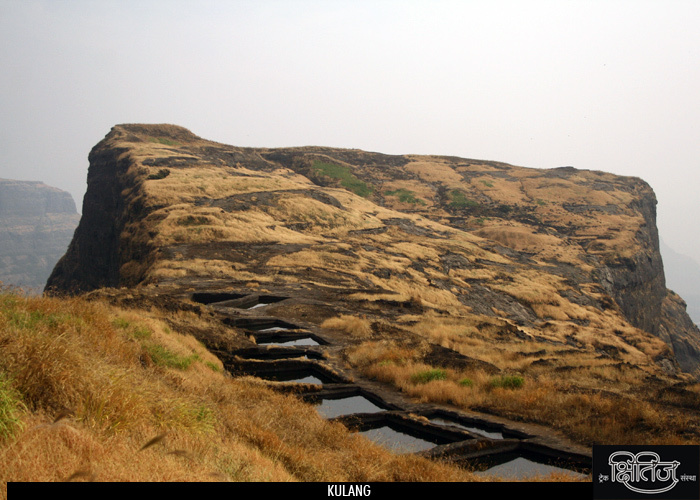 Alang, Madan and Kulung are amongst the tough forts in Sahyadri which have pretty steep hikes. Kulang needs a long hike and is the easier one, whereas Alang and Madan need climbing equipment. These all forts form the Kalsubai range along with Pabargad, Ratangad and Kalsubai peak. The second entrance of Kulang is still in good condition and we can see fortification also. When you enter through the entrance, towards right you will see 2-3 small caves. The middle cave is the biggest and it has 2 rooms. These caves are good for stay. There are 2-3 water tanks near these caves, out of which one has potable water. You will see the remnants of two demolished palaces behind these tanks. The palaces are big enough to accommodate good number of people. To the west of palace you can see a big bastion. From there you can see small hill called �Chotya Kulang� or the smaller Kulang. You can also see the Ghatghar village and reservoir of Wilson dam. After visiting the west side, come to the entrance and go left. Within 5 minutes you will reach the group of 10 cisterns. Water here is not potable. There is a rock carved Shiv Linga here. Going straight for 20 minutes from this place, you will reach near gully, where we can see an architectural wonder. The gully flows along the mountain where a barrier is built to obstruct the water coming from top. The water is first stored on the mountain top in tanks, which channel it to the gully and the small weir built. The water flows out through a �Gomukh�. The constructor of this beautiful system is unknown. After this you can go to east side where we can see Alang, Madan and Kalsubai. Ratangad to south-west adds to the scenic beauty. Ghoti is the nearest town to the fort, which is 9 km to the east of Igatpuri on NH3. The first route is Ghoti � Kalsuthe � Kulangwadi � Kulang. 10 KM from Ghoti, till Kalsuthe village you can reach by Auto or jeep. From here you need to walk for about 2 hours to reach Kulangwadi village. Though this village is the base village, the hike to the fort starts after 2 hours trail. After 2 hours of hiking we will reach to a plateau. The hike from here is steep and narrow with some scree. After 2 hours you will reach to first entrance. There are 100 steps between 1st and 2nd entrance. Near 1st entrance there is a small cave. You can see the beautiful valley of Alang, Madam and Kulang from here. The second route is Ghoti � Ambewadi � Kulang. From Ghoti, Ambewadi is 1 hour away by bus. You need to walk for 2 hours from Ambewadi. The trail is bit tricky and it�s recommended to take a pathfinder. The trail leads us to the plateau mentioned above where the way from Kulangwadi meets. You can find some caves on fort where 30-40 people can easily stay. Trekkers stay on Kulang and carry packed lunch / raw materials to prepare food. 1. Try to avoid Kulang in monsoon. 2. Alang, Madan, Kulang trek takes 2-3 days.